So let me get this straight… it’s shaped like R2D2. It’s radio controlled. It’s got a DVD Player. It’s got a Projector. It’s got an iPod dock. It’s got a radio. It’s got USB inputs. It will play MP4 files. 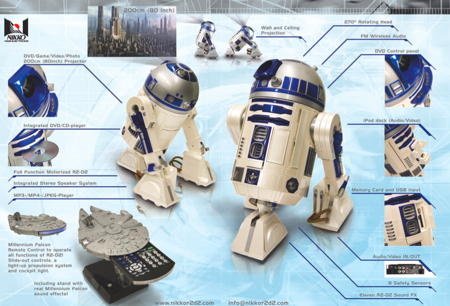 And its remote control is shaped like the Millenium Falcon? I’m totally hard right now.